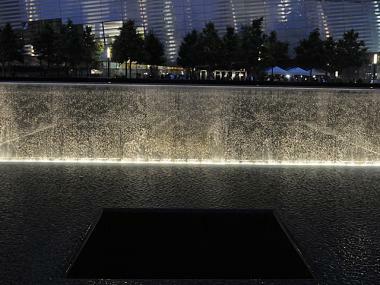 The 9/11 Memorial reflecting pool lit up at night. ​NEW YORK CITY — The city will mark the 16th anniversary of the Sept. 11 terrorist attacks with memorials, including the reading of the names at the 9/11 Memorial at the site of the World Trade Center attack. The annual commemoration is a gathering for family and loved ones of the nearly 3,000 victims, whose names are read beginning at 8:46 a.m. — which marks when the first plane crashed into the World Trade Center. The ceremony ends around noon.